Is it so late again? It's May! It's really May now and while I remember wishing for spring and some sun not too long ago it's almost as if it was summer now. How nice this is and I hope the weather elsewhere is at least as nice! It brings me in such a fine mood and there's almost no space for being sad or depressed. Just enjoying the sun is alright for me. In mid April I was really busy with dyeing stuff, altering and distressing shorts, like these shorts and leggings. I'm so glad they came out like this and I think I have a new favorite pair of jeans now. See you soon && take care! you are amazing! I found you on lookbook! 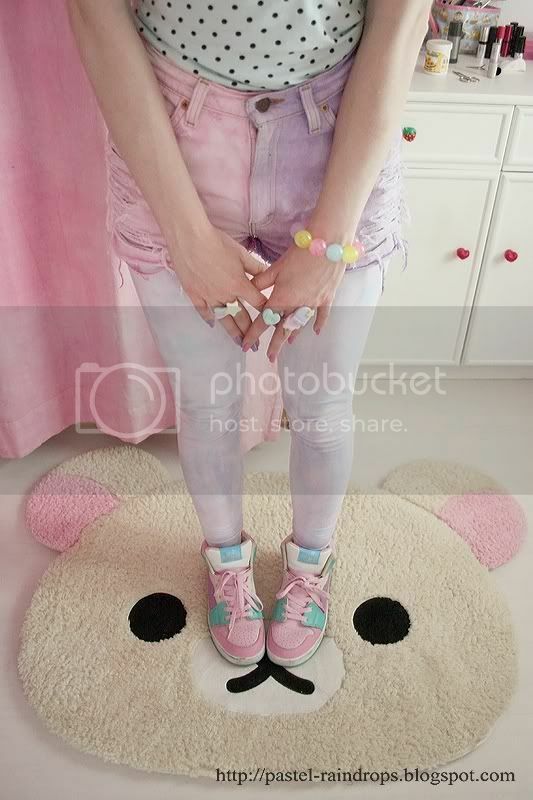 what kind of shoes are those? I want them! und deine nägel sind so verdammt lang ° o °) krasse sache!! The shorts are sooo cute!!!!! you look so sweet with that outfit! The shorts look so adorable!! They are from a Japanese brand called 'Amigo' but I bought them used so I don't know much about their origin, sadly. DAMN I LOVE YOUR BLOG... YOUR SO CREATIVE I AM LOVING THE TIE EFFECT JEANS.... SO COOL! !